Hmm... seems I overlooked the logic on the main spin boxes. I'll fix that. If you are referring to the values in the TTK box, those don't do anything yet. I forgot to hide the controls. That is a placeholder for a future TTK chart feature. Ok, both issues have been addressed in 0.95. Available on the download page. Cool stuff. I look forward to seeing the TTK feature when it's done. Out of curiosity, what purpose does the "Multiply Vertical Recoil:" checkbox serve? Is it intended to simulate the compensation made by the shooter in reaction to recoil? That is the only thing I could think of. The Multiply Vert Recoil is something that I added on account it was in Symthic's changes. I don't have a full understanding on what it does, but I believe you are correct. If it is checked, it is taking the product of that number, 30% for the default value, and the value for Y on all bullets of the burst. So that should, in theory, mean that you are gaining 30% of your recoil back between shots. I think that is correct... don't quote me on it. Unfortunately for that value, it is only going off of a number value, not something a bit more static like the ROF or Dec that would allow for more flexible calculations. Version 0.98 is up. 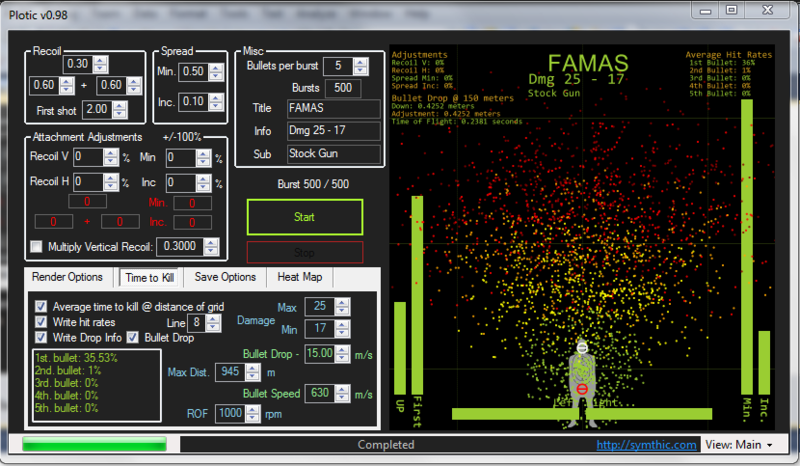 It now gives the option to display the bullet drop information, the required adjustment to hit the target at center mass from the set distance, and the time of flight. Some other goodies in this one. * I changed the printed lines to make them easier to read by alternating colors. * Adjustments are now visible in the bars graphs. * Saving scheme has been altered to allow for a more dynamic interface. 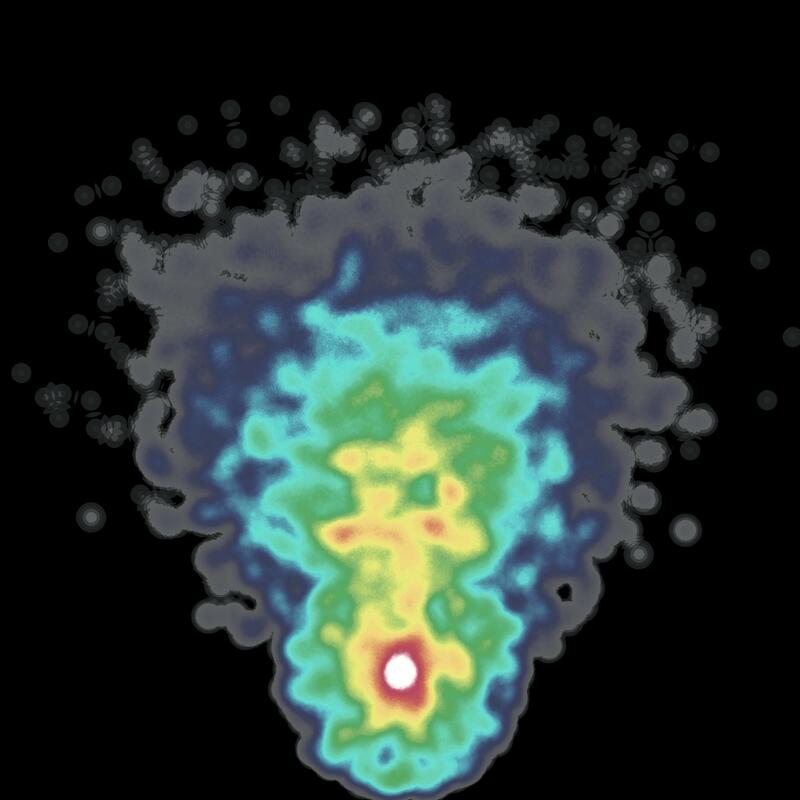 * Heat map information has been moved to it's own tab. * You will *soon be able to control what you want printed on the heat map as well, if anything. Here is a screenshot of the mainscreen. You can adjust the line width of the bullet drop/adjustment indicators. When viewing, you will want a larger number to see the markers. The saved image is 2000x2000, so having a line width of 1 is visible in the image. Here is a preview of the latest version. You can see the start of the TTK chart work. Version 1.0 is up and should be all working. I did notice that the bottom number of the Bullet drop chart isn't rendering correctly. For good measure, here are the standard and heatmap images that go along with the one above. Got rid of the Onclick code at the end of the post. The main view has soo many options that people get easily confused. Most of these could be under advanced tab. If I make functions to get data directly from files, would you integrate it so we wouldn't need recoil/spread/attachment adjustments anymore? You could simply select weapon and attachment. Multiply vertical recoil was/is there for exactly what Skittls said. <TitleText> is crashing the program in silent mode. Without it everything seems to be working like it should. YAY!... Feedback is always welcome. I do understand it has gotten quite a bit cluttered, I'll work on cleaning that up to make it easier. Looking at your TTK graph, I think i should be able to add that to the damage chart as another graph with the axis on the left side. Since both would be scaled the same in terms of distance, I think it would look nice while providing both infosets. I'd be glad to add the direct from file functions. We could probably even turn it into it's own class. I'll look into the Silent install issue. There isn't a check for invalid filenames... so make sure that the title doesn't contain any characters that would be invalid.